Tonight’s chart again shows the evening sky high to the east. 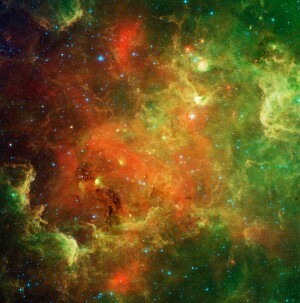 Below and to the left of the constellation Leo the Lion are dozens of very faint stars. They are Coma Berenices, otherwise known as Bernice’s Hair. The Greek-Egyptian astronomer Ptolemy and others considered it Leo the Lion’s bushy tail. 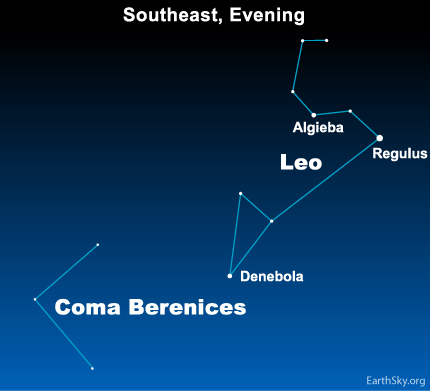 Coma Berenices remained part of Leo until several hundred years ago, when it was first listed as a separate constellation. The story goes that an ancient Assyrian Queen, Berenice, feared for her husband’s life as he went into battle. She prayed to Aphrodite, promising to cut off her long, luxurious curls if the king returned safely. He did, and Berenice kept her promise and cut off her hair, placing it as a sacrifice on Aphrodite’s altar. However, the next day the hair was gone, and the king was enraged that the temple priests had not protected the precious locks. However, a quick thinking astronomer saved the day — or rather night, by pointing to the stars of Leo’s tail. He told the king that these must not be Leo’s tail, but the Queen’s tresses placed in the sky by Aphrodite for all to see. The king and queen were appeased, and no priests were beheaded.